It has long been a nightmare of mine that I would for some unfathomable reason be connected to a serious crime with which I had no involvement. Last Tuesday morning I came back from town to find a large dark saloon car parked outside the house, and, assuming it was the estate agent with business next door, I waited for it to move before reversing in to the drive. Two men then got out of the car and came over to speak to me. “We’re investigating the murder of the little girl from Machynlleth and your van, with a sleeping bag in the back, was reported outside a derelict house. May we ask you some questions?” They invited themselves in. Fortunately I was able to tell them that on the Monday night April Jones had been abducted Jane and I were still on holiday in Germany, and that we took a taxi from the railway station on the Tuesday night ( the following evening) about 9.30 pm. Needless to say the taxi driver had some very strong opinions on the subject of the girl’s disappearance! But did I remember the name of the taxi company? “Well…..no…..it was just one at the head of the queue.” After I had answered a few more questions, however, I think they realised that I could not possibly have been implicated, and were happy to leave. With the alleged murderer already behind bars I suppose they were just tying up loose ends. But apart from the interesting observation that our home appeared to be “derelict”, the episode did have a worrying side to it. I’m often away from home for several days at a time on field trips, and sometimes no-one – not even Jane – would know where I was. It could be quite difficult to prove I was away from a crime scene if for some unknown reason I became a suspect. Would the data attached to a digital image be enough to prove one’s whereabouts? And if I had no results at all from the trip – and this does happen – how could I prove my innocence? It was a scary thought, so perhaps one should always take a few images wherever one is just to be on the safe side? As for Machynlleth, despite the dozens of pink ribbons, it was like a morgue on the Sunday afternoon following the girl’s disappearance. I spent an hour or so walking around the town to see if anything caught my eye; the answer was no. 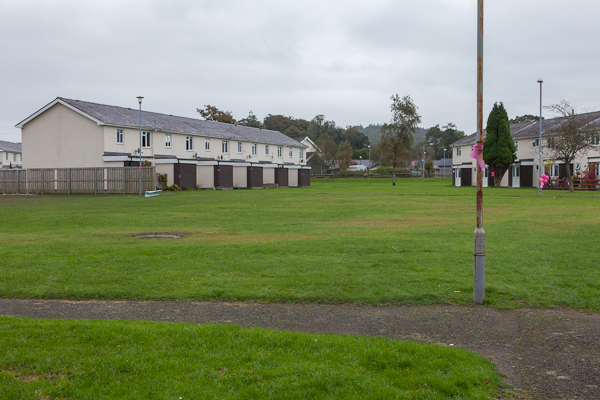 Despite mild and pleasant weather no children were playing on the grass on the Bryn-y-Gog estate where the abduction had taken place. A police constable – his job to prevent photographers and reporters getting too close to the house – stood on duty. I had a quick chat and wished him well. The following night I woke suddenly and saw the photograph I should have taken…… that policeman standing alone on the grass in the middle of the estate, with perhaps a pink ribbon or two somewhere in the frame. The following Wednesday – market day in Machynlleth – I made another trip there with the intention of re-creating the image I had seen in my minds eye. As it often is on a Wednesday the town was really buzzing and I had no hesitation in grabbing the camera and entering the estate through a rear gate. This time a gaggle of policemen was standing around chatting so any possibility of repeating what I had envisaged immediately became impossible. With their permission I spent a few minutes walking around the estate taking a few pictures. I just did what I could. As discussed in a previous post (Love Locks) it is often difficult to re-create an image – even an imaginary one like this! I could never work as a photographer in a formal setting. For me the joy of photography is almost always its spontaneity.